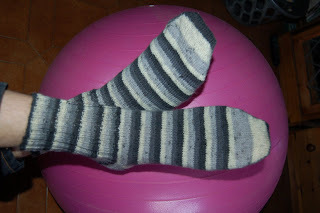 I actually think that Late Birthday socks are the norm around here, I have only managed to give 2 pairs on time, ever! These are Jordan’s and he loves them so that is good, I will just have to make sure that they don’t go in the washing machine by mistake as he recently felted his favourite jumper. It will now make a very cool handbag I think! Forgot to add a certain someone is off to Japan on Saturday any fantastic ideas as to what he can bring me back?? Knitting books, especially their stitch dictionarys, they are all charted and fantastic. The socks look great. Nice to see them on feet instead of on needles. They looked great on the needles, but look even better on the feet they were meant for. I had a machine/jumper incident too this week. My nice wee teal cardi is no more. Patchwork felting workshop anyone?